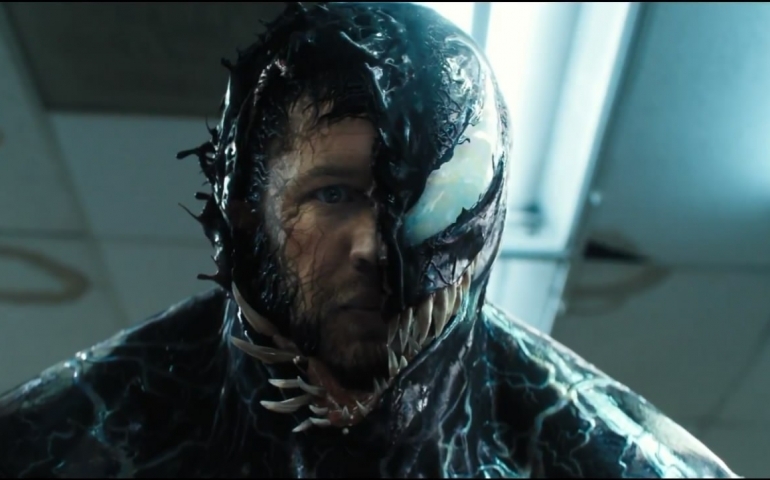 With the release of the first trailer for Venom, a discussion broke out whether or not the movie would be good. Then, as reviews for the movie came out, more and more people started to assume the movie was going to be bad. Movie critics have called Venom “mediocre,” “forgettable” and “uninspired.” However since the movie has been released and the audience has voted on it, Venom’s audience review is at 89% and given an average rating of 4.5 out of 5. Venom is the newest addition to the Marvel Cinematic Universe starring Tom Hardy as Eddie Brock. The character of Venom is what is referred to as a “Symbiote” which is a being that needs a human host in order to survive. Venom comes to Earth aboard an exploration vessel for a corporation called the “Life Foundation,” and he, alongside two others like him, make it to Earth in the hands of a scientist. Brock, a journalist, meets Venom while investigating the Life Foundation, and the movie begins here. The movie has scenes that will make you laugh. There are some one-liners that are absolutely hilarious. Moreover, the comedy in this movie is not forced– it flows naturally, making it funnier while also not interrupting the movie by doing so. Venom and Eddie, the main characters both voiced and played by Tom Hardy, interact with each other in a way that makes them bond and allows the audience to bond with them as well. Venom is not your ordinary hero: he is an anti-hero like Deadpool or Daredevil, meaning his movie is on the darker side, yet it’s still rated PG-13. While watching the movie, I agree the movie is definitely PG-13; however, being R rated would have made more sense with the character. It would have allowed some scenes that seemed to end short end with the gory intent of Venom. Venom has several of the traits that all Marvel movies have: Stan Lee makes a cameo with one line in the movie and there are also post credit cutscenes. In Venom, there are actually two cutscenes. The first one proceeds to open this world up to more characters that Venom is known to deal with. The second is less important and not necessary to stay for. The second clip is about a two-minute scene from the animated Spiderman movie that Sony is making, titled Spiderman: Into the Spider-Verse. In my opinion, the movie as a whole was great. Tom Hardy brings life to his character and, without trying, can make you laugh. The movie was going to be rated R, and I believe they should have stuck with that rating. Some scenes came across as if they were going to be gory and violent, but they simply stopped right before it happened. There were clearly scenes that would have been better if the movie stayed with an R rating. Yet, in the end, the movie was solid and was definitely worth watching if you enjoy Marvel movies.